Fine particulate matter (PM2.5) is the particulate matter with diameter equal to or less than 2.5 μm and has become a serious threat to human health as a number of epidemiological studies have demonstrated marked association between PM2.5 exposure and increased incidence and aggravation of respiratory and cardiovascular diseases [1, 2]. Once inhaled, PM2.5 deposits in lung tissues and diffuses in blood inducing lung and systematic injuries [3, 4]. Although the intrinsic molecular mechanisms are not well understood, inflammatory responses and oxidative stress have been proposed as fundamental mechanisms underlying the process [5, 6]. As the first defense line, macrophage is one of the most important parts of innate immune system and is a cross-link between innate immunity and adaptive immunity. In general, macrophages can be polarized into two distinct phenotypes: the classically activated macrophages (M1) and alternatively activated macrophages (M2). M1 macrophages which are mainly induced by lipopolysaccharide (LPS) are considered to have higher antigen-presenting capacity and release a lot of pro-inflammatory cytokines such as tumor necrosis factor alpha (TNF-α) and interleukin-6 (IL-6). On the contrary, M2 macrophages mainly induced by interleukin-4 (IL-4) act as anti-inflammatory ones and take part in regulating angiogenesis, tissue remodeling and wound healing [7-10]. The imbalance of M1 and M2 macrophages causes damage to the body and poses threat to human health. Toll-like receptor (TLR) can bound with LPS or other pathogens and promote the downstream events consequently. TLR/nuclear factor kappa B (NF-κB) is a classical signal pathway which is implicated in various diseases especially inflammatory responses [11-13]. Nowadays, whether PM2.5 induces macrophage polarization directly and the signal transduction pathway has not been fully elucidated. Sirtuin1 (SIRT1), a type III histone deacetylase, belongs to the silent information regulator 2 (Sir2) family and regulates a variety of physiological processes including oxidative stress, inflammation, cellular senescence, proliferation, apoptosis, and DNA damage response due to its ability to deacetylate various intracellular signaling molecules and chromatin histones [14-17]. Recent studies also indicate that SIRT1 plays an important role in the regulation of immune responses. Zhang et al reported that SIRT1 is an anti-inflammation factor and leads to amelioration of macrophage function . Whether SIRT1 is a potential regulator of macrophage polarization induced by PM2.5 needs to be further explored. MicroRNAs (miRNAs) are one member of endogenous noncoding RNAs family which participates in regulation of cell development, proliferation, differentiation and death. It has been suggested that the changes in their expression and their posttranscriptional regulator function are associated with many human diseases [19, 20]. Researchers have shown that air pollutants including PM2.5 can alter miRNA expression in recent years. Serena et al found an association between exposure to ambient PM2.5 and downregulation of several miRNAs in elderly men . Our pervious study showed that miR-146, miR-139 and miR-340 expressions are elevated during acute exposure to PM2.5 in mice . However, the role of these miRNAs especially in regulating the macrophage polarization caused by PM2.5 is not clear. In this study, we established the hypothesis that PM2.5 induces M1 polarization in RAW 264.7 cells. Then, we explored related regulatory mechanisms and found that PM2.5 regulates the expression of miR-146a-3p and augments M1 polarization by inhibiting SIRT1. PM2.5 samples were collected persistently by using high volume sampler system (Staplex® NO PM-2.5 SSI, USA) at the roof of a ward building in Peking University First Hospital which located in the central of downtown Beijing from October to December 2016. PM2.5 samples on the glass fiber filters were extracted in accordance with the method described previously . Final extracted PM2.5 samples were stored in the ultra-low temperature freezer. Different dosages of PM2.5 were weighted, re-suspended in culture medium with 1% fetal bovine serum or saline and sonicated for complete dissolution. The mouse macrophage cell line RAW264.7 was cultured in Dulbecco's modified Eagle's medium (DMEM, Sigma-Aldrich, USA) supplemented with 10% heat-inactivated fetal bovine serum (Gibco, USA), 100U/ml penicillin and 100μg/ml streptomycin (Gibco, USA) and maintained at 37°C in a saturated humidity atmosphere containing 95 % air and 5 % CO2. Cells were treated with different concentrations of PM2.5 (0, 5, 10, 25, 50, 100μg/ml) for 24h or pretreated with SRT1720 (1μM, Selleck Biochem, USA) or EX527 (10μM, Selleck Biochem, USA) for 6h followed by PM2.5 (25μg/ml) for 24h. MiR-146a-3p mimic and its negative control, anti-miR-146a-3p and anti-miR-146a-3p negative control were purchased from RIBOBIO Company (Guangzhou, China). MiR-146a-3p, anti-miR-146a-3p and corresponding control microRNAs were complexed respectively with ribo FECT ™ CP Transfection Kit (RIBOBIO, Guangzhou, China) according to the manufacturer's instructions. RAW264.7 cells were transfected with miR-146a-3p mimic (50μM), miR-146a-3p inhibitor (100μM) and corresponding negative control for 24h followed by PM2.5 (25μg/ml) for 24h. RAW264.7 Cells were cultured in the 96-well plate and there were six wells for each group. After treatment with different concentrations of PM2.5 (0, 5, 10, 25, 50, 100μg/ml) for 24h, the mediums were discarded and the fresh mediums containing 10μl CCK-8 solution were added in each well according to the instruction of EnoGene Cell Counting Kit-8 (CCK-8, DOJINDO, Japan). The plate was put in the incubator for about 3 hours. The wavelength of each well at 450nm was measured by microplate reader when the time was up. Twelve adult Balb/c mice (female, 9weeks old) were purchased from SPF Biotechnology Company (Beijing, China) and were housed in the specific pathogen-free environment with room temperature (23°C-25°C), relative humidity (40%-70%) and 12h light/dark cycles. The study conformed to the animal welfare and was approved by Laboratory Animal Ethics Committee of Peking University First Hospital (NO.201706).The mice were randomly divided into control and PM2.5 treated groups. Mice were anesthetized and endotracheal instillation of 50μl saline or PM2.5 (5mg/kg) dissolved in the equal volume of saline was performed in the control group or PM2.5 treated group respectively once a week for consecutive eight weeks. The mice were sacrificed for further experiments on the 7th day from the last instillation. miR-146a-3p (5'-3': CCTGTGAAATTCAGTTCTTCAG).The forward and reverse primer of U6 were included in the Mir-XTM miRNA First Strand Synthesis Kit. qRT-PCR was carried out in a 20μl reaction system containing 1μl cDNA and 10μl POWER SYBR® Green Master Mix (Thermo Fisher Scientific, USA) on Step One Plus Real-Time PCR System (7500, Applied Biosystems, USA). The relative expression of mRNA or miRNA was calculated by 2-ΔΔCT method as described elsewhere and normalized to the expression of β-actin or U6 respectively. According to the binding site on SIRT1 mRNA 3′-untranslated region (3′-UTR), a wild-type (wt) SIRT1-3′-UTR gene or a mutated (mut) SIRT1-3′-UTR gene was constructed and cloned into the pMIR-REPORT miRNA expression reporter vector (Obio Technology Corp, Shanghai, China). The HEK293T cells (National Infrastructure of Cell Line Resource, Shanghai, China) were transfected with empty vector, SIRT1-3′-UTR-wt vector and SIRT1-3′-UTR-mut vector with miR-146a-3p mimic or scramble control. After 48 h, the transfected cells were analyzed by Dual-Luciferase Reporter Assay System (Promega Corporation, Fitchburg, WI, USA). The total protein was fractionated from the whole Cell lysate using RIPA buffer and cocktail (Sigma-Aldrich, USA). Protein concentrations were quantified by BCA method (Beyotime, Shanghai, China). Equivalent amounts of extracted protein were resolved on SDS-PAGE and transferred onto NC membrane. After blocking the background staining with 5% non-fat milk in TBST, the membranes were incubated in primary antibodies against SIRT1 (1:500, Abcam), iNOS (1:1000, Abcam), TLR4 (1:500, Abcam), TLR2 (1:500, Abcam), NF-κB p65 (1:1000, CST), phospho-NF-κB p65 (1:1000, CST), β-actin (1:2000, ZSGB-BIO, China) overnight at 4°C. Immuno-reactive proteins were detected using HRP conjugated secondary antibodies and ECL kit (Merck Millipore, USA) according to the manufacturer's instructions. The bands were quantitated by ImageJ v1.28 system and the fold expression was indicated as the relative protein level. After treatment, the culture supernatants were isolated, centrifuged and stored at -80°C until measured. The commercially available ELISA kits (NOVUS, China) were used for detection of TNF-α and IL-6 according to the manufacturer's instructions. The absorbance at 450 nm was measured and corrected at 570nm in a microplate reader. Statistical analysis of the data was performed using the SPSS14.0 system (SPSS Inc, USA) by two tailed Student's t-test for comparison of two groups or analysis of variance (ANOVA) and appropriate post hoc analysis for comparison of more than two groups. Bar graphs were protracted using Prism (GraphPad Software Ltd, version 5.0 USA). All data in the figures were expressed as means ± standard deviation (SD). Values of p< 0.05 were considered to be statistically significant. To evaluate the effect of PM2.5 exposure on the cell viability of macrophages, RAW 264.7 cells were exposed to 0, 5, 10, 25, 50 and 100μg/ml PM2.5 for 24h and the cell viability was detected by CCK-8 assay. It showed that the cell viability was reduced slightly compared with the control group but there is no significant difference (Figure 1A). To determine the impact of PM2.5 exposure on macrophage polarization, RAW 264.7 cells were treated with different dosages of PM2.5 (0, 5, 10, 25, 50 and 100μg/ml) for 24h. The mRNA expressions of M1 and M2 markers were quantified by qRT-PCR. The results showed that the mRNA expressions of M1 markers were gradually increased with the increase of PM2.5 concentration but not that of M2 markers. The mRNA expressions of iNOS and IL-6 were elevated significantly by 25, 50 and 100 μg/ml PM2.5 treatment and TNF-α mRNA expressions were significantly higher in 10, 25, 50 and 100μg/ml PM2.5 group compared with the control group (Figure 1B-1F). Consistent with the results of qRT-PCR, Western blotting analysis showed that compared with the control group, the protein levels of iNOS were significantly increased by 25, 50 and 100μg/ml PM2.5 treatment (Figure 2A, Figure 2B). The concentrations of IL-6 and TNF-α in the supernatants were also significantly increased compared with the control group by using Commercialized ELISA kits (Figure 2C, Figure 2D). 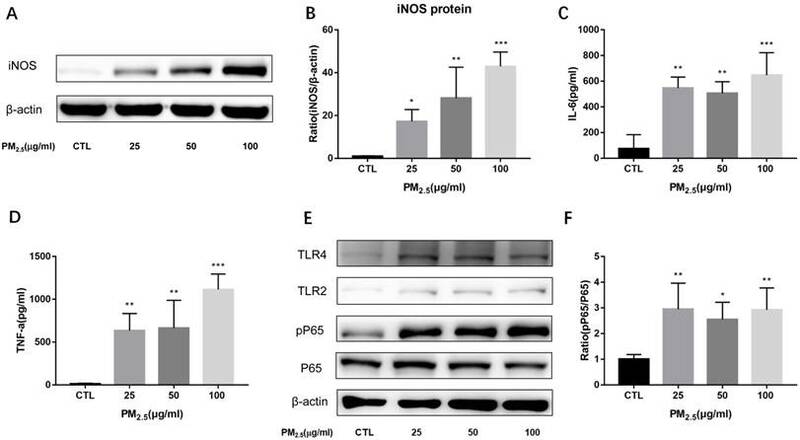 To explore whether TLR/NF-κB signal pathway was related with the PM2.5 inducing inflammatory responses, the activation degree of TLRs and NF-κB was assessed by Western blotting. Our data revealed that the protein levels of TLR4 but not those of TLR2 were significantly increased after 25, 50 and 100μg/ml PM2.5 treatment. Furthermore, the ratios of phosphorylated NF-κB p65 versus p65 subunit were also elevated in PM2.5 groups compared with the control group (Figure 2E, Figure 2F). Taken together, these results demonstrated that PM2.5 can induce M1 polarization directly and TLR4/NF-κB signal transduction pathway might be involved in the process. To examine the expressions of SIRT1 after PM2.5 exposure, we detected SIRT1 protein and mRNA levels both in vitro and in vivo experiments. SIRT1 protein levels were markedly down-regulated by PM2.5 stimulation in RAW264.7 cells (Figure 3A, Figure 3B). 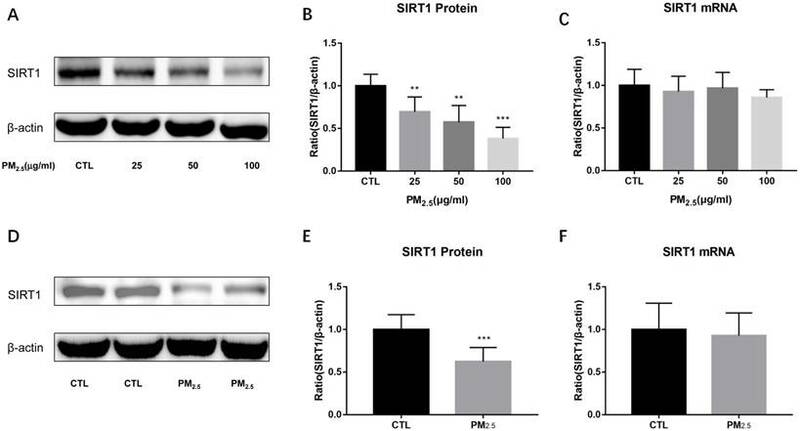 Similarly, compared to the saline treated mice, PM2.5 instillation significantly decreased the expression of SIRT1 protein in the lung (Figure 3D, Figure 3E). However, there was no significant change in SIRT1 mRNA level neither in vitro nor in vivo experiments (Figure 3C, Figure 3F). These results indicated that there might have post-transcriptional regulation of SIRT1 expression after PM2.5 exposure. To verify whether SIRT1 take part in the regulation of M1 polarization induced by PM2.5, RAW264.7 cells were pretreated with the SIRT1 specific agonist SRT1720 or antagonist EX527 for 6h followed by the PM2.5 (25μg/ml) exposure for 24h. Compared with single PM2.5 exposure group, the mRNA expressions of iNOS and IL-6 were decreased in the PM2.5 plus SRT1720 group. At the meanwhile, the mRNA expressions of iNOS, IL-6 and TNF-α were significantly higher in the PM2.5 plus EX527 group than the single PM2.5 exposure group (Figure 4A-4C). Consistently, the protein level of iNOS was increased in the PM2.5 plus EX527 group and decreased in the PM2.5 plus SRT1720 group compared with the single PM2.5 group (Figure 4E, Figure 4F). The above results showed that SIRT1 might be an upstream regulator of M1 polarization induced by PM2.5. In order to observe the expression of miR-146a-3p in PM2.5 treated RAW264.7 cells, we detected the expression of miR-146a-3p by qRT-PCR. Compared with control group, the expression of miR-146a-3p showed a significant elevation in 25, 50, 100μg/ml PM2.5 exposure group, though there is not explicit dose dependent relationship (Figure 5A). To explore the mechanism of miR-146a-3p in PM2.5 exposed RAW264.7 cells, we found that SIRT1 was a potential regulatory targets of miR-146a-3p predicted in three bioinformatics databases (TargetScan, miRanda and miRWalk). As shown above, the protein expression but not the mRNA expression of SIRT1 was decreased after PM2.5 exposure. It indicated that miR-146a-3p might decrease the expression of SIRT1 through post-transcriptional regulation. The putative target sequence is located in the 494-500nt of the 3'-UTR of murine SIRT1 mRNA. To verify this, the luciferase analysis was used to identify the predicted binding site of miR-146a-3p and SIRT1. The SIRT1 mRNA containing the wild-type (wt) putative binding site or mutated (mut) binding site of miR-146a-3p were constructed (Figure 5D) and cloned into the luciferase expressing pMIR vector. SIRT1-3′-UTR-wt vector or SIRT1-3′-UTR-mut vector was co-transfected with mmu-miR-146a-3p mimic or scrambled control (miR-NC) into HEK293T cells respectively. The results showed that the relative luciferase activity decreased significantly in cells transfected with SIRT1-3′-UTR-wt vector, but luciferase activity showed no significant change in cells transfected with SIRT1-3′-UTR-mut (Figure 5E). This result confirmed that miR-146a-3p directly regulated SIRT1. To further explore the potential regulation relationship between miR-146a-3p and SIRT1, untreated RAW264.7 cells were transfected with miR-146a-3p mimic, inhibitor and scrambled controls for 24h. The efficiency of transfection and the expression of SIRT1 mRNA were detected by qRT-PCR (Figure 5B, Figure 5C). The expression of SIRT1 protein was detected using Western blotting analysis (Figure 5F). The SIRT1 mRNA expression showed no significant difference among different treatment. However, SIRT1 protein increased significantly after inhibition of miR-146a-3p and decreased significantly after overexpression of miR-146a-3p. These results showed that Overexpression of miR-146a-3p downregulated the expression of SIRT1 protein in untreated RAW264.7 cells. Lastly, to observe whether miR-146a-3p could regulate M1 macrophage polarization in PM2.5 treated RAW264.7 cells, cells were pre-transfected with miR-146a-3p mimic, inhibitor and scrambled controls for 24h followed by PM2.5 (25μg/ml) treatment. Western blotting results showed the SIRT1 protein expression decreased significantly in cells treated with mimic compared with the control group. Whereas, The SIRT1 protein expression significantly increased in cells treated with inhibitor (Figure 6D, Figure 6E). Overexpression of miR-146a-3p significantly increased the mRNA expression of M1 markers including iNOS, IL-6 and TNF-α in PM2.5 treated RAW264.7 cells. 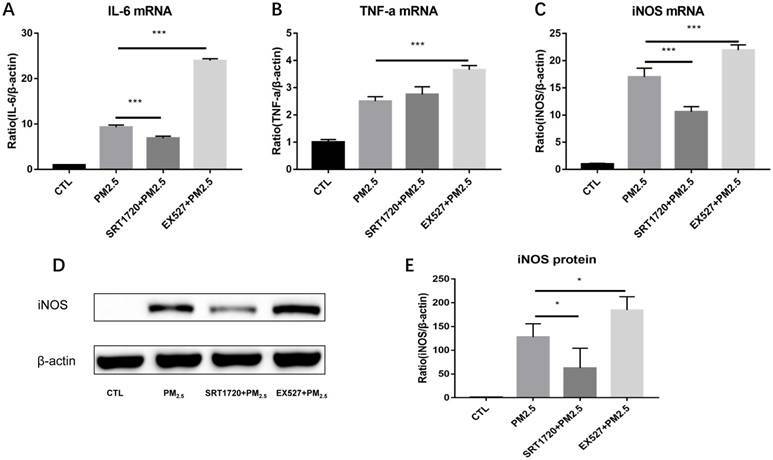 To the contrary, inhibition of miR-146a-3p significantly decreased the mRNA expression of iNOS, IL-6 and TNF-α (Figure 6A-6C). The Western blotting analysis also shown that overexpression of miR-146a-3p significantly increased the protein expression of iNOS. Conversely, inhibition of miR-146a-3p significantly decreased the protein expression of iNOS (Figure 6D, Figure 6F). Above results demonstrated that decreased miR-146a-3p upregulated SIRT1 protein and suppressed M1 polarization in PM2.5 treated RAW264.7 cells. China, a developing country which is undergoing a rapid period of urbanization and industrialization suffers from environmental pollution inevitably. One of most serious and widespread environmental pollution is air pollution and it can't be eliminated in short term. PM2.5, a complex mixture of small particles and liquid droplets in the air is one of the most important sources of air pollution. Similar to other studies [24-26], our previous studies indicated that PM2.5 contained high concentration of endotoxin up to 20.8ng/m3 and toxic heavy metals such as Cu, Zn, Al, Mn and Pb [22, 23]. Once inhaled, PM2.5 can cause damage to the whole body. Although the associated mechanism has not yet been elucidated, inflammation and oxidative stress are involved in the process. As the first line of defense, the balance of M1 and M2 macrophage is crucial for inflammatory responses in handling PM2.5. Previous studies have indicated that PM from different sources affected pro-inflammatory cytokines secretion of M1 and anti-inflammatory response of M2 [27-29]. In this study, we found that 25μg/ml and higher concentration of PM2.5 collected from Beijing, one of the most polluted cities in China significantly induce the expression and release of pro-inflammatory cytokines of M1. Whereas, different concentrations of PM2.5 didn't affect the expression of M2 macrophage markers. Consistent with previous studies [27, 30], our study demonstrated that PM2.5 exposure induce M1 polarization directly and initiate persistent inflammatory response though the chemical composition of PM2.5 is complicated and the mechanism underlying the effect has not been fully elucidated. Macrophages recognize pathogens via pattern recognition receptors (PRR), such as TLR. TLR2 and TLR4 are the major members of TLR family and have their own ligand and distribution features [31, 32]. Our results indicated that the PM2.5 exposure increased the expression of TLR4 but not that of TLR2. Subsequently, activation of NF-κB was demonstrated. TLR4/NF-κB signal transduction pathway might be involved in the M1 polarization induced by PM2.5. In order to further explore the related regulatory mechanism of M1 polarization induced by PM2.5, the potential role of SIRT1 which was proved to be anti-inflammation factor was detected [33, 34]. Firstly, we found that PM2.5 exposure significantly decreased the protein level of SIRT1 in vitro and in vivo. This is similar to previous studies [35, 36] except that our study showed PM2.5 exposure didn't significantly alter the mRNA expression of SIRT1. Then, we found that pretreatment with SIRT1 agonist SRT1720 significantly decreased the expression of M1 markers in PM2.5 exposed RAW264.7 cells. Conversely, pretreatment with SIRT1 antagonist EX527 further increased the expression of these markers. These results demonstrated a novel notion that SIRT1 is the upstream regulator of M1 polarization induced by PM2.5 and there might have post-transcriptional regulation of SIRT1 expression. MiRNAs are acknowledged as key molecules in post-transcriptional modification. They can bind directly to the 3′-UTR of target mRNA leading to mRNA degradation or translation suppression. Due to the stable expression in specific tissues and the conservative role in different species, miRNAs have been considered to have therapeutic potential and became a research focus in recent years [37, 38]. Previous studies have indicated a variety of air pollution exposure associated miRNAs [39-42], but there is still no consensus because the designs of these studies were different. Our previous study indicated that 10 miRNAs (miR-691, miR-181a, miR-146a, miR-146b, miR-21a-5p, miR-129, miR-155, miR-139-5p, miR-21a-3p and miR-340) were upregulated in lung tissues of mice exposed to PM2.5 and involved in regulating Th1/Th2 balance . 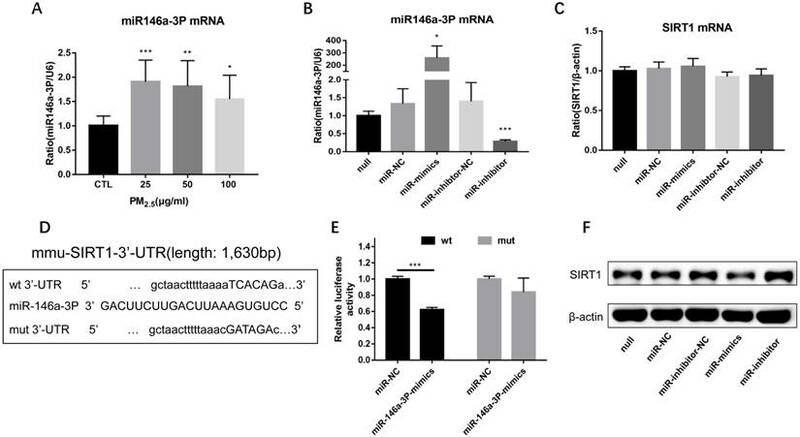 Among these miRNAs, miR-146a has been shown to regulate pro-inflammatory cytokine production in endotoxin-stimulated human monocytes [43, 44] and has been proved to be associated with enhanced phagocytic activity in patient monocytes . However, the role of miR-146a family particularly miR-146a-3p in PM2.5 exposed macrophage has not been elucidated. In this study, we found that miR-146a-3p directly targeted SIRT1 which is the upstream regulator of macrophage polarization as mentioned above. Our experiments demonstrated that overexpression of miR-146a-3p downregulated SIRT1 protein in untreated RAW264.7 cells. Not only that, inhibition of miR-146a-3p upregulated SIRT1 protein and suppressed M1 polarization in PM2.5 treated RAW264.7 cells. This suggested that miR-146a-3p might be a potential therapeutic target of inflammatory responses induced by PM2.5. There are some limitations in this study. First, we demonstrated different dosage of PM2.5 exposure for 24h induced M1 polarization directly in RAW264.7 cells, the effect on macrophages from other sources and for other exposure time need to be further explored. Second, we found that SIRT1 is the upstream regulator of M1 polarization induced by PM2.5, but the signal pathways involved was not analyzed in this study. Last, our study illustrated that miR-146a-3p is a very promising therapeutic target for the treatment of PM2.5 induced inflammatory responses. Next, transfected animal studies should be prepared to find a reasonable dose and measurement of treatment. In a summary, this study proved that PM2.5 upregulates the expression of miR-146a-3p and induces the inflammatory M1 polarization by inhibiting SIRT1 in RAW264.7 cells. TLR4/NF-κB signal transduction pathway might be involved in the process. Overexpression of miR-146a-3p directly downregulated the expression of SIRT1 protein. Inhibition of miR-146a-3p upregulated SIRT1 protein and suppressed M1 polarization in PM2.5 treated RAW264.7 cells. 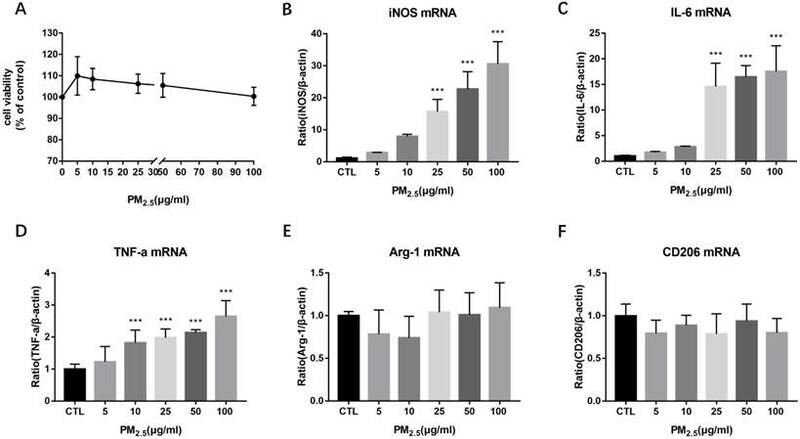 These findings suggest that miR-146a-3p could be a potential therapeutic target for PM2.5 induced inflammatory responses. The work was supported by the grants from the National Natural Science Foundation of China (No. 81500014), the Beijing Municipal Natural Science Foundation (No.7161013 and No.7174357), the Capital Medical Development and Scientific Research Fund (No.2016-1-4071) and National Key Research and Development Plan (No.2017YFC1309500). Corresponding author: Guangfa Wang, M.D., Ph.D., FCCP. Department of Respiratory and Critical Care Medicine, Peking University First Hospital, No.8 Xishiku Street, Xicheng District, Beijing, China, 100034. Email: wangguangfacom.